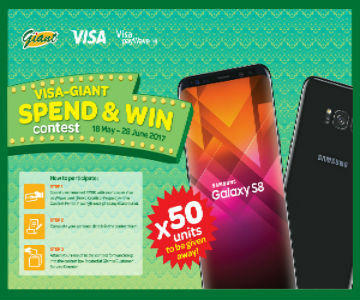 Home » Card Contest » Giant » lucky » lucky draw » purchase » Samsung » Samsung GALAXY S8 » smartphone » spend » Visa » VISA-GIANT Spend and Win Samsung GALAXY S8 Contest! VISA-GIANT Spend and Win Samsung GALAXY S8 Contest! Spend a minimum of RM80 with your Visa or Visa payWave card (Debit, Credit or Prepaid) within Contest Period in a single receipt at any Giant outlet. Complete your personal details in the contest form. Attach your receipt to the contest form and drop into the contest box located at Giant's Customer Service Counter. Visit VISA-GIANT Spend and Win Contest terms & conditions for more details.